What has Apple learned about retail in the last decade? The first Apple Store opened in 2001. In fact, two of them were opened on the same day in two different locations: Tysons Corner in Virginia and Glendale in California. These first two stores were small, especially compared to today's flagship stores in key locations like Manhattan, Sydney, Tokyo and Regent Street, but they contained the seed of an idea that would later find fruition in 300 stores worldwide, culminating in Apple's latest and greatest: London's new Covent Garden store. In fact, this article is already out of date. Apple Stores are springing up so quickly that store number 301 was recently opened in Castle Towers Shopping Centre in the northwest suburbs of Sydney.! 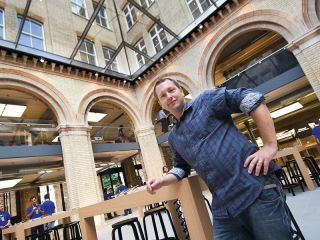 The Apple Store was the brainchild of Ron Johnson, Apple's Vice President of Retail. Right from the start, he had a very focused vision of what an Apple retail experience should be: open, airy surroundings, the Genius Bar, the mix of glass windows and wooden desks and the attitude to sales that let the products do the talking. Johnson joined Apple in 2000 after previously working as Vice President of Merchandising for Target Stores. In typical Apple style, his initial work on a retail store for Apple was kept top secret, in case it tipped off competitors. Even his name was kept quiet within the company and it wasn't until the official announcement of the first Apple Store in Virginia that the majority of people within Apple found out his real name. Initial press reaction to the concept of an Apple Store was negative. "I don't think we convinced one person at the time," he said during his acceptance speech on behalf of Apple for the Award of Excellence from the Success for Design Conference in 2004 – and yet Apple proved everybody wrong, again. Whatever magic formula makes up Apple's retail experience, it works. Very quickly the number of Apple Stores in the US ballooned until, nine years later, it reached the staggering 229 stores we have today. Of course, Apple didn't simply stop at the borders to its home nation – Apple Stores can now be found in 10 countries worldwide, and Apple is spreading into more all the time. Perhaps the key to its success is that an Apple Store is a place where you can not only learn about Apple products, but you can actually try them out, and get help if you're having problems. The Apple kit is presented beautifully on desks throughout the store for you to play with to your heart's content, without getting disapproving looks from the staff. Sure, you'll likely to be approached by a sales assistant wearing an Apple T-shirt fairly quickly when you enter the store, but they're normally just happy to chat about the products, rather than give you the hard sell. And, the Apple Store is more than just a shop – you can also get trained in all the latest Apple applications, check into the Genius Bar to get help with any problems you have, or be entertained by celebrities and musicians at a live event. Oh, and we all know Apple Stores have free public Wi-Fi too, so it's a great place to check your email. Whatever country you're in though, you always know you're in an Apple Store – it's just so unmistakably Apple. But long-term Apple watchers are starting to notice a few differences to the usual Store layout of late. All the familiar elements – glass staircase, wooden desks – are there, but things are starting to change in Apple land. The new Covent Garden Store is a prime example. It's actually one of four stores that Apple has opened around the same time, including two stores in Paris (Louvre and Opéra) and one in Shanghai, China, that are starting to break the mould. These new stores still have that unmistakable Apple feel, but rather than making each store an identikit clone of the last one, Apple is now adding a bit of local flavour to proceedings. For example, both the Opéra and Covent Garden stores have retained as much of their building's original architecture as possible, seeing them restored back to their original 19th-century splendour. "Over the last 10 years we've learned a lot," said Johnson, speaking at the opening of the Covent Garden Store in August. "It turns out that our most significant stores, what people would call 'flagship stores', are our best stores. They're our highest profit and highest traffic stores as well, so we love building these significant stores." You might be surprised to learn that the Regent Street store is Apple's busiest store in the world, with even more visitors than the more visually impressive store on 5th Avenue. It seems that big stores work, and so does making those stores more distinctive and unique, which is good news for everyone. Going forward, it looks like Apple's focus will be on bigger stores, and making each one special. Covent Garden is one of the premier tourist destinations in the West End, making it the perfect spot for a new Apple Store. Covent Garden started life as a fruit-and-veg market, around 1654, but by the 18th century it had become a well-known red-light area. An act of parliament was drawn up to control the area, and Charles Fowler's neoclassical building was erected in 1830 to cover the market area (the fortuitously named 'Apple Market' is still there today, but now mainly sells tourist gifts and crafts). The new store takes over from Regent Street as the largest Apple Store in the world. Occupying a Grade II listed building on the Piazza, it's a visual delight for anyone – not just Apple fans – in combining architectural work from the 1870s with Apple's hypermodern approach to design, including the famous glass staircase. In fact, this store has two of them – a spiral staircase at the front and one at the rear enabling access to two more floors.